Benalla P-12 College is committed to looking out for each child’s best interest by providing a child-safe school environment with a zero tolerance to child abuse. Children have the right to be safe and protected and we actively seek to listen to the voices of our students as a collective or as individuals so they develop a sense of positive empowerment. The Child Safe Standards help guide the actions of all staff, students, parents and other visitors to the college to ensure that Benalla P-12 College provides a child-safe school environment with a zero-tolerance to child abuse. The Victorian Government has introduced the child safe standards for all schools and organisations working with children up to 18 years old. The standards are a direct response to the recommendations from the Victorian Parliamentary Inquiry into the Handling of Child Abuse by Religious and other Non-Government organisations. The standards require schools to have a child safety policy, child safety code of conduct, strategies to prevent child abuse and respond to suspected child abuse, recruitment procedures to minimise or remove risks of child abuse, and strategies to promote child participation and empowerment. In implementing the standards schools must take into consideration the diversity of all children. The needs of Aboriginal and Torres Strait Islander children, children from culturally and linguistically diverse backgrounds, children with disabilities, and children who are vulnerable must be a particular focus. You are able to view our Child Safe Policy and Child Safe Code of Conduct on our website. 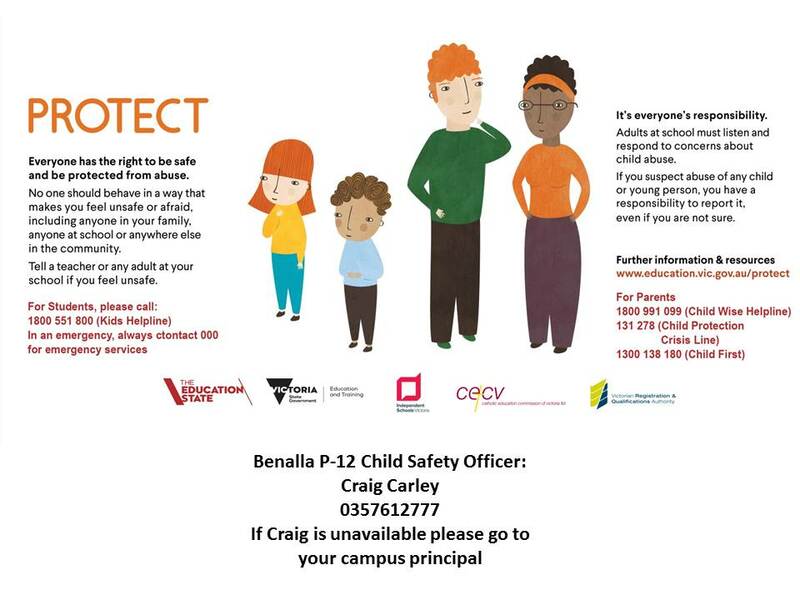 If you have any questions, queries or concerns you can direct these to the school Child Safety Officer Craig Carley or the school Principal who can assist and support regarding the safety and wellbeing of children associated with Benalla P-12 College.